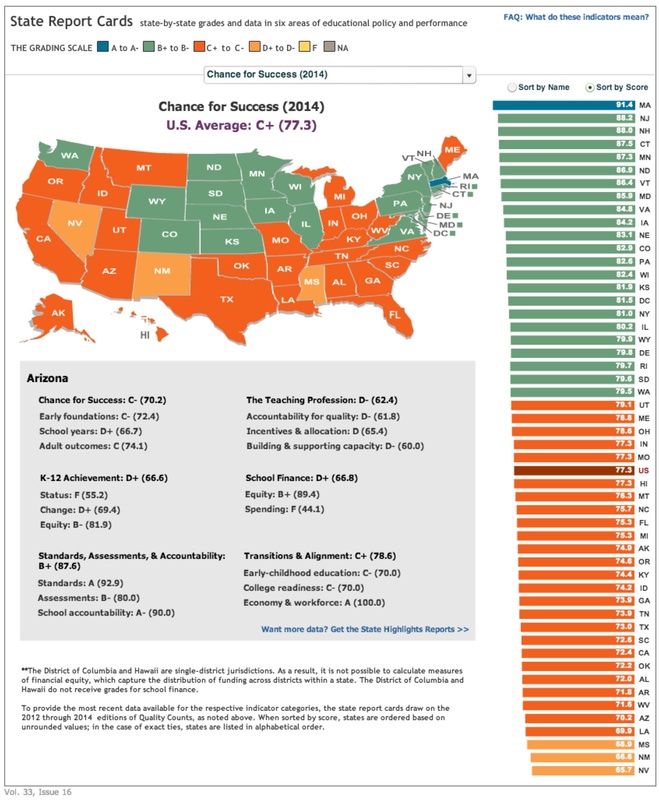 At first glance, Arizona’s C- grade in Education Week’s Quality Counts 2014 report released today seems on par with the national average and 25 states’ grades, but Arizona ranks fifth from last among all states and Washington, D.C. 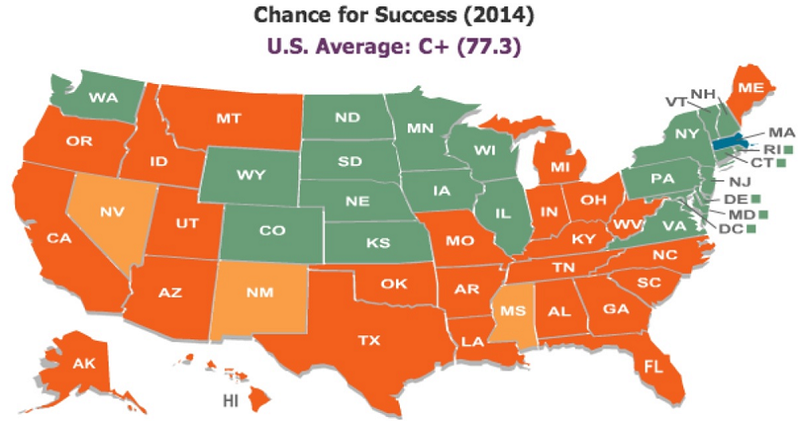 The United State’s grade as a whole was a 77.3, a C+, while Arizona’s was 70.2, a C-, according to Education Week’s Quality Counts 2014 State Report Cards. Six indicators were considered in the report. Arizona received a B+ in standards, assessments and accountability, a C+ in transitions and alignment, and a C- in chance for success. Its Ds in K-12 achievement, school finances and the teaching profession dragged Arizona’s grade down. 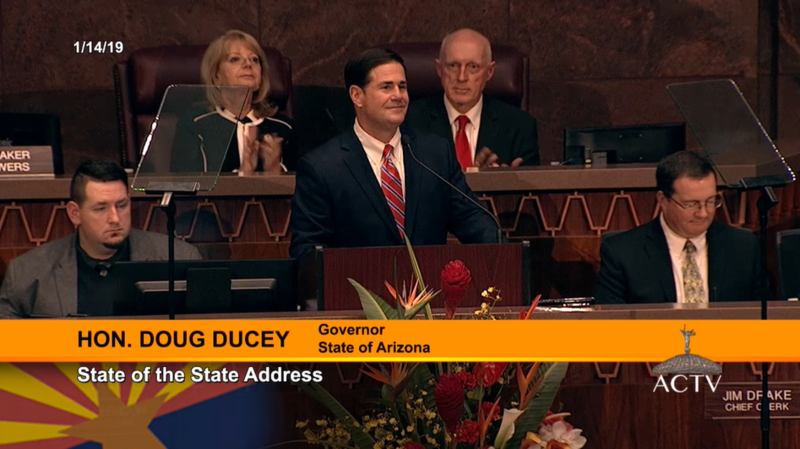 The Quality Counts 2014 Arizona Report Card shows the Arizona’s performance on the reports six indicators and how it ranked against other states and the nation. Right click on photo and open in a new tab to see report in detail. In standards, assessments and accountability, Arizona earned an A+ in standards and an A- in school accountability, but a B- in assessments brought the state’s grade down to B+, still higher than the nation’s B.
Arizona’s lower grade in assessments is because state tests do not include short answer questions or portfolios, extended answers in subjects other than English, and social studies/history assessments were not aligned to academic standards, according to Education Week’s Quality Counts 2013 Arizona Highlights report. For transitions and alignments, Arizona’s strong economy and workforce earned the state an A+, 100 percent, but it’s 70 percent or C- grades in early-childhood education ad college readiness and brought the grade down to a C+, slightly below the nation’s B-. Arizona scored lower in early childhood education because it has no school readiness definition, assessment and intervention plan and lower in college readiness because college prep courses are not required for high school graduation and high school graduation requirements don’t match college admission requirements, according to the Education Weeks Quality Counts 2013 Arizona Highlights report. 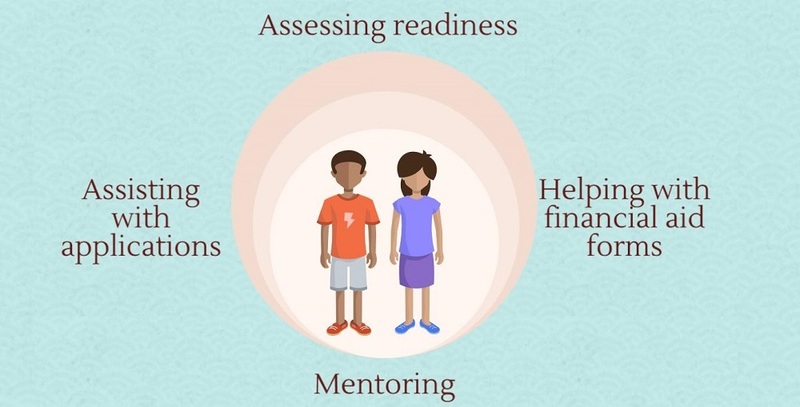 Chance for success focuses on the link between education and beneficial outcomes during three stages of life, drawing on 13 indicators from early childhood, school-age years, and adult’s education level and work. Arizona’s C- in chance for success was boosted by adult outcomes and early childhood foundations, but remained lower than the nation’s C+. K-12 achievement measured states’ performance on 18 indicators, including National Assessment of Educational Progress results, high school graduation rates, and Advanced Placement exam scores, and tracks current performance, improvements over time, and equity on poverty-based achievement gaps. Arizona earned a B- in equity for its efforts to close poverty-based achievement gaps, but student achievement levels lower than the national average brought the grade down to a D+. The nation scored 70.2, a C-, for K-12 achievement, a slight increase from 69.7, a D+, in 2012, the last time this category was analyzed. Eight factors were considered in looking at school finance. Half focused on school spending and the other half analyzed the distribution of funding across state districts. Grades were based on financial data from 2011, the most recent year available for all states. Arizona rated a B+, 89.4 percent, in equity, higher than the national average of 85.6 percent. But Arizona’s spending was an F, 44 percent, significantly below the nation’s D, 65.4 percent, and dragged Arizona’s grade down to a D+, 66.8 percent. The nation earned a C in school finance, the same as a year ago. Wyoming had the highest per-pupil spending at $19,534 after adjusting for regional cost differences, while Utah’s was lowest at $6,905. Arizona’s per pupil spending, at $8,495 using 2011 data, ranks it as 47th among the 50 states. 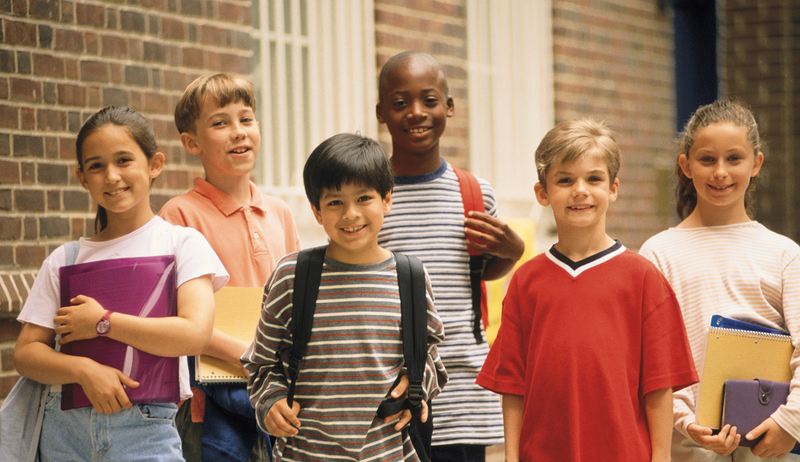 The national average for per-pupil spending is $11,864. Arizona’s D- in the teaching profession category was below the nation’s C grade, but is not a measure of teacher quality. Arizona scored Ds in all three major indicators of accountability for teacher preparedness and state data systems linking teacher performance to student achievement, teacher incentives, and supporting new teachers and developing existing teachers.